The Panasonic Industrial Company Custom Products Department, Industrial Sales Division, has introduced a dual-mode 10''(diagonal) color computer display and home computer applications. The unit, model CT-160, features a front panel switch that changes the display from a full-color unit for color graphics or video games to a sharp black and white data display for business use. Model CT-160 accepts a composite video input signal and incorporates a built-in audio system for use with games or speech synthesizers. It easily reproduces a 40 x 25 character display. 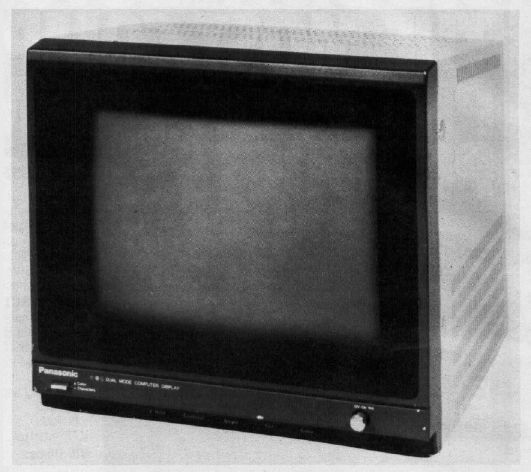 Equipped with video input/output connectors with 75 ohm/Hi Z termination switch, the new Panasonic computer display is UL listed and carries a FCC Class B computing device certification. Suggested retail is $400.